On the Main Line: Vagshal's revision of the history of the Vilna Talmud, or, One of the most egregious examples of censorship I have ever seen. Vagshal's revision of the history of the Vilna Talmud, or, One of the most egregious examples of censorship I have ever seen. The Romm printing firm of Vilna ("The Widow and Brothers Romm") published an edition of the Talmud in the years 1880-86. Although this edition had its flaws, it also had many virtues, among them the inclusion of an incredibly rich array of commentaries never before included in a Talmud, or never included together. Some of them were printed on the Talmud page directly, and therefore were elevated to a status which was previously impossible for them to have, such as the comments of Rabbenu Hananel or, more recently, the annotations of Rabbi Akiva Eger. In additional, the original print was beautiful. Since the Romm edition was photographed and reproduced countless times, most people are familiar with its look, but not necessarily the grandeur of the original. Almost every edition since has merely reproduced images of this Talmud, to the point where the look of this edition has become nearly synonymous with the Talmud itself, and most people would find using other editions a little strange. Instant worthwhile improvement. Another useful improvement was to give the entire text of verses quoted in the Gemara or in Rashi or Tosafos. In a world where tampering with classics usually results in an inferior product, few would argue that these changes were unwelcome. Some new versions even took a text critical approach, and tried to correct printer errors using venerable old printed versions. In addition, the old approach of printing from photographs of the Vilna Shas, or worse, from photographs of photomechanical editions, led to blurred words, especially in the small print in the back, which apparently no one cared much about. The new editions are clear and in some cases even quite attractive. One of these new editions is by Wagschal (or Vagshal), but more below. The production of the original Vilna edition was exceedingly labor intensive, expensive and ambitious. It required manuscripts, copyists, proofreaders, scholars, rabbis, libraries and time. The story of how all these many moving pieces came together was included in the Talmud at the very end, right after the commentaries to Massekhes Niddah. Seven pages long, titled אחרית דבר, (Afterword, or When All is Said and Done, from Ecc. 7:8), the tale of the many labors and mountains which needed moving are recounted by the man who made this Talmud possible, Shmuel Shraga Feigensohn, who was the director of the Romm firm since 1867. In my view he was also a modest man, since his name appears only one time in the many volumes of this Talmud, at the very end of the אחרית דבר. Feigensohn including some notable tangential "extras" in the footnotes. For example, the first page includes a complete reckoning of the dates of completion of individual tractates. He also included tombstone inscriptions on some of the Romm family member's graves - graves which have since been destroyed. He also included thrilling bibliophiliac intrigues, such as the adventure of how they got the Vatican Library to let them work even though it was already summer vacation - the library would be closed for four months out of the year (!) and they needed to see certain manuscripts of Rabbenu Hananel found only in that library. Apparently they had not realized this, and were stuck in Italy without a gondola oar, so to speak. Worse, the plan was to print the Talmud according to the order of the tractates given by Maimonides, so it wasn't as if they could have skipped these specific tractates. Considering that the entire project took 6 years, clearly a four month delay was a huge problem. That is, until Rabbi Raphael Nathan Nata Rabbinowicz, author of Dikduke Soferim, stepped in. He was persona grata at the Vatican Library, and that summer he happened to be in Rome. He was given full library privileges, even though it was closed altogether. This meant that not only was he able to use the library, but even on minor Catholic holidays, when normally it would be closed, and he also could use it after noon, when normally scholars had to leave. In short, he had a golden ticket. And he used his influence to obtain special permission for the copyists working for Romm to gain access. The Cardinals involved are thanked by name in the footnote. Getting back to Wagschal, in the most recent edition they reprinted the Acharis Davar, in newly set type! This was most welcome, as in the original it is a bit hard to read. Lo and behold, it is one of the most censored Jewish texts I have ever seen. Whole footnotes are missing; no tombstone inscription, no list of when the tractates were complete, no Cardinals. Incredible. Looking deeper one noticed various spelling mistakes, and the fact that Shmuel Shraga Feigensohn's name has been totally excised (more on that below). Here's how the end appears in the original, followed by the Wagschal "version." As the expression goes, I know what you did, Wagschal. Furthermore, (although this is obviously more trivial) Feigensohn used a Hebrew chronogram to indicate the year 5646/ 1886. That is, he dated his document - and it is his document - יום א' י"ג ניסן שנת גמר וסיום תלמוד בבלי לפ"ק, or Sunday, 13 Nisan, the year of the completion of finish of the Babylonian Talmud. The latter sentence, or part of it, adds up to 646, which is 1886. The word גמר is part of the chronogram, but it isn't meant to be counted, so it is printed in a smaller font than וסיום תלמוד בבלי. Yet in Wagschal the entire phrase is written in the same size font, which means that if you count it all up you get the year 889, or the year 2129. Now, although I suppose the reader doesn't have to imagine too much to think of a reason why they would remove the names of Cardinals (wrong as it is) why would they have removed this man altogether? The answer most assuredly lies in the fact that Feigensohn was a kind of maskil. Not the pork-eating kind (were there those?) but the sort of S.J. Fuenn-Matisyahu Strashun kind. An example of the sort of thing which probably makes people uncomfortable is his introductory essay to the Vilna edition of the Talmud Yerushalmi (link) called שערי חומת ירושלים, which relies extensively and frankly on Zecharia Frankel's מבוא הירושלמי, which is mentioned (both the man and the book) countless times (see, for example, pages 9 and 10 of that link). Dan Rabinowitz has already noted that the Israeli Yated Ne'eman based a large article in 2003 on the history of the Vilna Shas on another lengthy essay written by the same Feigensohn, also excising portions of it, and totally failing to mention his name - although referring to him all the same as "One of the workers on the project" as it directly quotes him (saying something inspirational and frum I might add). Speaking of Frankel, see here where I showed the excision of Frankel's haskama in a book of sermons of a disciple of the Vilna Gaon. People should also know that Feigensohn edited the אוצר התפלות, which might be the most popular work on prayer there is. It certainly is the source for a great deal of the Artcroll siddur commentary, so it is not as if Feigensohn's work is marginal or he can be totally ignored. Interestingly, whomever was responsible for these changes in the Wagschal edition also revealed a certain ignorance by not removing certain names that no doubt it would have wanted to, if only they knew who these people were. See the list toward the end of the Afterword, which gives the major scholars who helped make the edition happen - not the money men, I might add. I suppose it would be particularly outrageous to remove any names from the very passage which begins with a quote from the Rashba explaining how important it is to publicize the names of those involved in a mitzvah. Nevertheless, it's hard to see how they would not have wanted to remove the name of S.Z.H. Halberstamm, a maskil, or Alexander Kohut, who was formerly a Status Quo rabbi in Hungary, and at the time a rabbi in a Reform congregation in New York (albeit he himself was a Historical School type of rabbi). You can also see in the next paragraphs how it also mentioned Salomon Buber (who is mentioned numerous other times in the Afterword). It mentiones Adolf Neubauer of Oxford (in this post I showed an excerpt from a review by Neubauer in which essentially he calls out Frankel for being too Orthodox), but at least it calls him Professor Dr. Buber, though, is even given a שליט"א after his name. If anyone has a better explanation for why these names were left in - my explanation is they didn't realize - I'm all ears. Readers might find it interesting that in fact in the original Wagschal edition the Afterword remained unchanged, and photomechanically reproduced from the original, so that when I called it to the attention of some they replied, "What do you mean? I don't see what you're talking about." However, in the 2007 Wagschal edition you will find this censored Acharis Davar. Another scholar pointed out to me that the Wagschal edition also seems to have forgotten to remove Mordechai Plungian's name (note 1), something which is of concern to Steipler circles. He allowed himself the theological speculation of the significance of this "miss"
למעשה, Plungian was not such a terrible guy, and I view Vagshal's error in this case as a siman min ha-shamayim that Plungian has been vindicated (if you like, Plungian's תשובה has apparently been accepted on High). Not that long ago I came across a Wagschal catalog for the new edition, describing all the many useful additions and changes, with scintillating examples. Of course this one wasn't mentioned, although I did notice that it actually referred the reader to Acharis Davar for some other, trivial point. Here is the new improved Acharis Davar in the Wagschal 2007 edition. Remember, you can also download Scribd documents. I invite readers to comb it more carefully and help notice all the changes. Also see this post about a claim from 1904 that the Romm firm had a plan to expand to New York and print English judaica, including an English translation of the Talmud. 1)"it is one of the most censored Jewish texts I have ever seen. Whole footnotes are missing; no tombstone inscription, no list of when the tractates were complete, no Cardinals." The tombstones, not really, or not exactly. I included them just because it should be pointed out too. The other stuff, sure. I will expand a little bit later, as I will be away from a computer for several hours, but the short answer is that he was an editor for Romm, and a maskil. He was a biographer of his teacher R. Menashe of Ilya; and the source, for example, of the well known statement of the Vilna Gaon that just as there is pshat and drush in Torah, there's also pshat and drush in the Mishnah. His Miluim were included in the Romm edition of the Shulchan Aruch, which the Steipler felt had no place and could/ should be removed. IIRC he cited the Chazon Ish (or possibly his personal copy of the Shulchan Aruch) in support, and this is normative in his and Rav Shach's circles. btw, some of the scans (scribd?) don't appear on my computer. It's not hard to figure out why they omitted certain things like the tombstones and dates for completion of the different masechtos. They probably said "We need the space, and no one is interested in this anyway." I doubt they realize that tombstonology is its own fascinating (to people other than me) area of study. Do you have more info on S.Z.H. Halberstamm? Like, was he related to rabbi Chaim of Sanz? Are the Scribd document embeds working? Gabbe, I agree, those are space, formatting issues. Still, a stone cold bad idea. Chaim, here's his entry in the Jewish Encyclopedia. I don't know the exact relationship, but he was obviously some kind of relative of the Divrei Chaim. You can see part of his yichus on the title page of SZH's father's sefer. As you can see, he was a descendent of R. Tzvi Hirsch of Halberstadt, from whom the Divrei Chaim also, pardon the pun, stamms. Of course this gives lie to the idea that the Divrei Chaim himself changed the name from Halberstadt. Incidentally, what seems to be going on is the following: what I often try to show, which is that the relations and lines between the haskala/ Wissenschaft and traditional Orthodox society in eastern Europe were blurry is not only noticed by me. New opportunities arise every time a sefer from that era is reprinted, whether it's to remove German words in Latin characters, the occasional name of non-Jewish scholars, or the names or honorifics of maskilim or other religiously undesirables. Obviously the presence of Frankel in the Yerushalmi from 85 years ago in no way implies that any given reader was okay with it - but it was the only game in town, and it came with the new Yerushalmi. Now there is an especially unique opportunity: the vast majority of Orthodox Jews have absolutely no idea who these people are, and anyway they don't read the small print, and these works are newly set so you can do anything you want with them. the scribd documents aren't loading by me either. וצ"ע. "this gives lie to the idea that the Divrei Chaim himself changed the name from Halberstadt." So what is the real story behind the name-change? I don't know, but since the father of our Halberstamm (born in 1832) must have been at most 20 years younger than the Divrei Chaim, and since he was related, and had the same last name, I conclude that the Divrei Chaim did not himself change it. It could be that it was a kind of pun. I also note that tes and mem sofis look very similar, which may have lent itself to a visual as well as linguistic pun. So, my assumption is that some common ancestor used Halberstamm, rather than the Divrei Chaim himself changing it. Nachum, I'm not sure about the lions. This is not the only example of lionectomy. In recent years the frontispiece of the Romm press has been appearing on tallis bags and parochesin, and whomever made it, also removed the lions. I don't know enough about the Israeli scene to know if such Islamic influence could have penetrated, or why. I guess it is possible. Note that Chabad also has something against depictions of non-kosher animals, but I'm not sure why that would have anything to do with it. There could be some deep sociological reason, or it could be work of one graphic designer who thought these lions looked creepy (and I'm inclined to agree). Thanks Joel. I also wish it weren't so. Well, add Wagshall to the list of publishers who are pesulim le'edut. Is there any reason to presume that they actually print the text of the Talmud truly? There is a major difference between not wanting to canonize a Maskil's Torah and mentioning his name in a book. Of course there are those who don't recognize this distinction. I would guess that the Achris davar is more of a result of an ego trip than censorship. I would guess that it was not to be included at all as this is a "new" Shas. It was put in at the last minute by a not very bright person ( witness the date stupidity. Bolding of letters for dates is very common . )and he took the large print only. This would explain the missing Matzava as well. I'll try to look in an OZ v'hadar (not one of my favorites) and see what they've done. My Schulsinger has an additional Achris Davar on ther contributions. I notice that you are a fan of fonts used for information. You had a piece on the root letters a while back. There is a side effect, however. Bolding on occasion causes a word to go to the next line. Those of us who are used to the Tzuros Hadaf can find this a problem looking for things. Your theory, that is was the work of a stupid person, is plausible. I guess that's a good reason why a stupid person should not be working on a Shas. I would be surprised if the question asked by the Anon who commented prior to you, "is there any reason to presume that they actually print the text of the Talmud truly?" will not occur to others. Your point is well taken. I have never seen this particular Shas. I would tend to believe that text is accurate. I worry about the improvements. I have seen editing in some of the "new" rishonim manuscripts which "fixes" text(at least they note that its a correction) because they didn't know a passuk. There are limudim which quote Psukim which can refer to more than 1 Possuk. Someone who does not know the Sugya with a Concordance or just an Iphone app can easily complete the Passuk wrong. The Vilna Shas has some errors and typos as can be expected in a work of that magnitude. But it was worked on by people who knew Shas. I have been told that computer checks on prewar Sifrei Torah an current ones have a huge difference in error rates. I would also tend to believe that the text is accurate, whatever that means. In fact, they made numerous corrections, as I mentioned in the post, in accordance with earlier printed editions and corrected outright printing errors, and they also reincorporated the Jesus stuff. 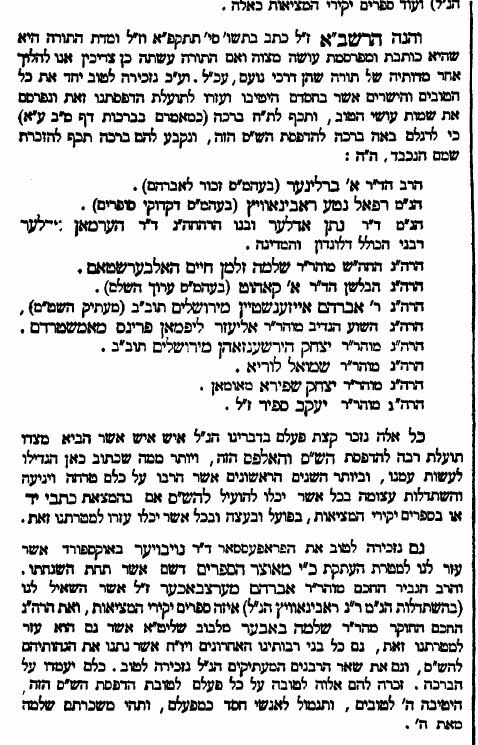 Someone told me that the Hagahos Yaavetz also included certain parts which were deleted in the original Vilna Shas. But the point isn't if they were honest in fact, but the impression this sort of thing can create with the public. In any case, your problem is a general one with people editing texts that have no clue how to do so. I don't know one way or the other if the people who worked on the Vagshal are competent. The fact that they've chosen to make an eclectic text (=eclectic text means to compile corrections from numerous sources, to produce a new text which never really existed) is something which I can understand, but am not a fan of. At least if they made a complete list of all such changes, but I don't think they included it. "I have been told that computer checks on prewar Sifrei Torah an current ones have a huge difference in error rates." Which sifrei torah have more errors and which have less? "or it could be work of one graphic designer who thought these lions looked creepy." Or, the graphic designer was not skilled enough to convert the lions into gray-scale graphics. That only applies to this, not the paroches and tallis bags. As you're writing re the Talmud, here's some pieces of interest, albeit on atangent: Re Fridlander's forged Yerushalmi Kodshim and various points re Talmud editions. -- Which is a continuation of his essays on the topic, in vols 8; 11-16. [There may also be readers' comments towards the end of each journal, but I haven't looked through them all]. All fascinating reads, most are available at hebrewbooks site, others can be found in select libraries or stores. The prewar Seforim had far fewer mistakes. Not sure if that means anything. Seforim that are more correct may be more likely to survive 80 or 100 years. Anon, thanks. If anyone can read Hungarian, his phd dissertation is on Friedlander. I'll be happy to send a copy to anyone who is interested. I don't think anyone maintains that the Divrei Chayim was the original Halberstam, I have heard it attributed to both his grandfather and father. >I don't think anyone maintains that the Divrei Chayim was the original Halberstam, I have heard it attributed to both his grandfather and father. Clearly someone does, or else I wouldn't have (mistakenly) assumed that to be the default position. On the very first page of Bromberg's biography (unpaginated, but page 9) he writes this. I'm not sure if this is his own expansion of the story, or if one of his biographical sources says it. You speak of new editions of the Talmud beginning to bold-face the dibbur hamat'chil in Rashi as if it were a new idea. Similarly, elevating other commentaries to prominence on the main Talmud page. I have a small Beitzah, printed by Proops in Amsterdam in the 1740s, which also has both: the dibur hamat'chil for Rashi is in boldface square print, and the Maharsha has been elevated from the back of the book to the main page. They printed a few other tractates in this format. See an old post of mine for an example (with pictures - click on pictures for full-size). Thanbo, I don't mean it's a new idea. It's a new idea to spruce up the Vilna Shas, rather than endlessly reproducing it in photograph with all its aesthetic drawbacks. Very nice post. If you don't mind my asking, how did you acquire that Beitzah? Heirloom or purchase? Purchase. Heirloom? Ha. Neither of my grandfathers were religious. Bought it on Ebay, years ago when book dealers were still feeling their way around trying to set fair prices for Ebay auctions. Got a number of things cheaper than I would have paid in Boro Park or at Kestenbaum's. More like Israel prices for used/antique books. Two relatives with the same name change don't necessarily indicate that the name was changed by a common ancestor. Case in point: Dad and his brother Uncle Max changed their name from Beckerman to Baker, not wanting to have Germanic last names at the beginning of WW2. The third brother, Uncle Jack, stayed Beckerman, leading to the irony that my grandparents had five Jewish grandchildren with the non-Jewish name Baker (via Dad & Uncle Max), and five non-Jewish grandchildren with the Jewish name Beckerman (via Uncle Jack). I imagine at least some non-Orthodox Jews keep a family article or two. Not everyone realizes that a 200 year old book shouldn't be discarded, but plenty of people do. I agree about name changes, but the point was that Halberstamm is descended from the same Rabbi of Halberstadt as the Divrei Chaim, also surnamed Halberstamm. That would make them 4th, 5th or 10th cousins - I'm not sure. But they were definitely related. Sure. An article or two. I have my grandfather's tallis, which I'm sure he was given in 1912 when they got married in Proskurov, Ukraine. There are a couple of moth holes, and one of the corner panels (for reinforcing around the holes for the tzitizs) is fraying, but it's still usable. I used it for the chuppah at my wedding - my grandparents died in 1985, I was married in 1991 (20 years ago tomorrow). That IS the default version, especially in Chasidic circles. Chasidim claim that he changed his name because he had a "k'peida" not to mention names of cities, for many of them were originally pagan names. That's the same thing as Bromberg, only he says the Divrei Chaim himself changed it. Thanbo: Or take someone very much in the news, Charlie Sheen. His father changed his name from Estevez; he changed it as well, independently, but his brother remains Emilio Estevez. 1) Will all this be included in Marc Shapiro's anticipated book on censorship? 2)What's the deal with "shas yonason"? Other than the Vilna edition, that's the one edition I still see hanging around. It looks kind of similar to the standard Vilna one, but its not quite the same. 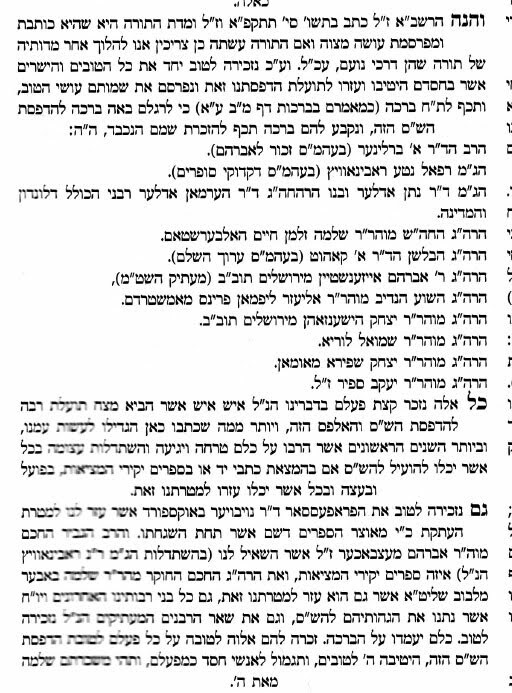 the scan following the comment about missing lions on the shaar blaat is of the "Vilna Shas Hachadash" not the Vagshal Moznaim edition is that the edition the bulk of the post is about ? It's the Wagshal Nehardea edition. It's posssible that the Shaar blatt was licensed to other editions. There's also a whole thing with the Slavita Shas, which IIRC Rabbi Oberlander touches in those essays (or at least other ones?). That was a chasidim vs misnagdim battle then, and there are no Slavita Shas'n around today, as it seems no one has the interest in reprinting it (waste of $ etc), and just all stick happy-go-lucky with Vilna edition. IIRC, one of the differences would be if the Rashash's commentary would be omitted, and amongst others - the Tzemach tzedek's (Lubavitch) commentary would go in. Anyone have what to say on it? (Again, Rabbi O spilled a lot of ink on the subject of the stories THEN, but why not NOW)? "It's the Wagshal Nehardea edition. It's possible that the Shaar blatt was licensed to other editions. " it is no longer showing in the post, but it was definitely not the Vagshal one it was the Vilna Chadash the 2 companies are competitors who do not share things like that. Awesome post. Must subscribe to your blog.